A luxury self catering cottage set within the stunning grounds of Gordon Castle in the heart of Speyside. It overlooks a 9 acre walled garden lined with mature fruit trees and is only a few feet away from the picturesque lake and the curling pond. This charming 4 bed roomed cottage sleeps 8 and comprises of a dining room, 3 bathrooms, sitting room with open fire and a dining kitchen. It has recently been refurbished to a high standard with crisp white linen and fluffy duvets on each of the beds. Gordon Castle is an exclusive private castle and 450 acre estate situated near Fochabers in the heart of whisky country. It was historically the principal seat of the Dukes of Gordon, built by George Gordon, the 2nd Earl of Huntly in the 1470's. Garden Cottage is a picturesque cottage which exudes charm and character with a combination of modern day luxury and historical presence. The sitting room has a cosy open fire and a door opening out to the walled garden where you can relax and enjoy the seasons of the fruit trees in the walled garden. The spacious well equipped kitchen/diner makes catering a joy and is the perfect place to enjoy a long relaxing breakfast. The bedrooms are all individual and tastefully decorated with period pieces and beautiful bedding. 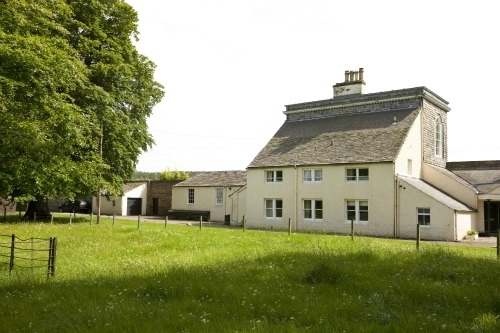 This country cottage will make an ideal get away no matter what the make up of your party.